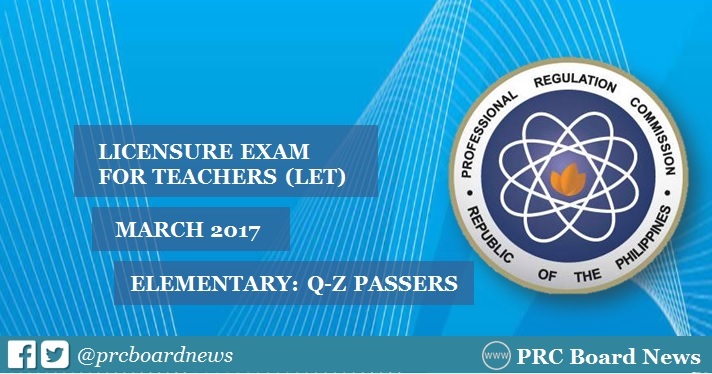 The Professional Regulation Commission (PRC) released on Monday, May 22, the full results including the list of passers for March 2017 Licensure Exam for Teachers (LET) Elementary Level. In order to pass the March 2017 LET, an examinee must obtain an average rating of not less than 75% and must have no rating lower than 50% in any of the tests. Those awaiting results may now view on this page the complete list of passers with Q-Z Surnames. The examination was conducted in 18 testing centers nationwide which include Bacolod, Baguio, Cagayan de Oro, Catarman (Northern Samar), Cebu, Davao, General Santos, Iloilo, Legazpi, Lucena, Manila, Puerto Princesa (Palawan), Rosales (Pangasinan), San Jose (Occidental Mindoro), Tacloban, Tuguegarao, Pagadian and Zamboanga. The LET board exam is composed of two (2) parts for Elementary: General Education (40%) and Professional Education (60%) and three (3) parts for Secondary: General Education (20%), Professional Education (40%) and Specialization (40%).